What's The Craziest Airport In The World? Pictured above is the runway for the Union Glacier Camp in Antarctica. It barely counts as an airport, but even then, it's an incredibly crucial lifeline for operations on the continent. And that's really because of one simple reason. The entire runway is composed of blue ice. Blue ice is blue for much the same reason that water is blue. Now I know what you're thinking – isn't ice usually white? Well, it is, because it's got air in it. But when ice has been sitting in a glacier for a really long time, all the air gets completely squeezed out. And when that happens, what you're left with is beautiful, impossibly blue ice. And a runway composed of the stuff is important. Most runways in frigid polar regions are mostly made up of packed snow, and planes need to use skis to land on it. But a blue ice runway, like the one at the Union Glacier Camp, sits atop a glacier, and because of unique Antarctic desert-like conditions, there's no snow cover at all. It's just pure ice, all the way down, which allows planes to take off and land using their regular wheels and tires. Which means they can carry more fuel, and more cargo, than a plane equipped with skis. Of course, ice is slippery, so planes can't really use their wheel brakes, and are limited to air brakes and reverse thrust. That means blue ice runways tend to be several miles long. 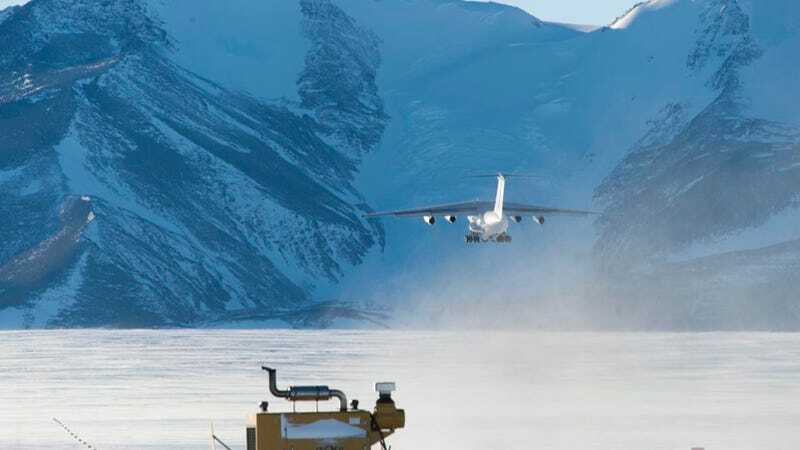 But maybe the Union Glacier Camp Blue Ice Runway doesn't constitute the craziest idea for an airport in the world. Drop your candidate for the craziest airport in the comments below, along with a reason for why it's so nutty. I'm sure you can do better than a strip of Antarctica that looks like solid sports drink.